One of the most prestigious manufacturers from each of its respective industries has joined forces to produce a range of motorhomes that offers something quite different from the rest of the competition. The new Hymer ML-T line-up is based on the Mercedes-Benz Sprinter and was launched halfway through the 2014 season, so it was the first of Hymer’s 2015 collection to break cover. The first sign of something new is, of course, the unmistakable and hard-to-miss Mercedes-Benz star logo (the three prongs represent land, sea and air), which takes pride of place at the front of the vehicle. (The typical Hymer logo built into the radiator grille has been eschewed). This new range offers something quite distinct from Hymer’s Fiat Ducato-based motorhomes. For a start, the Sprinter base vehicle is rear-wheel-drive so it has different driving characteristics from a front-wheel-drive Ducato or Peugeot Boxer. Two models are available: the ML-T 580 is the version with fixed twin beds, which is ideal for touring couples who would prefer to access the washroom during the night without having to disturb one another. The other model, the 560, offers a transverse fixed rear bed. Both models have an L-shaped front dinette, with midships kitchen and washroom. Like Hymer’s Exsis-t range, which we reviewed earlier this year, the ML-T is a semi-integrated motorhome, built around a chassis cab. As always, Hymer has done a good job of hiding the join between the cab and habitation as much as possible, for example with upholstered B-pillars and cabinetwork that stretches into the roof above the front seats. Our test ’van was fitted with an optional UK-friendly separate oven and grill, plus a dual-fuel hob and a tall fridge with built-in freezer compartment. Kitchen storage is practical, too, featuring drawers with dividers to keep things organised and easily accessible, plus a large overhead locker. On the road, we found that acceleration was very good, thanks to the powerful engine. The seven forward gears mean the gearbox won’t dither over changes. On a mixture of road conditions, including stop-start motorway traffic, cruising on dual carriageways and country roads, we recorded impressive economy figures of 35.36mpg, although the ’van was unladen. The Hymer ML-T 580 is priced from £53,130, excluding on-the-road charges. You can customise the vehicle to your exact requirements by browsing Hymer’s extensive options list. Some of the extra goodies fitted to our test ’van included an automatic transmission, collision and lane-change assistant, metallic exterior finish to the driver’s cab, leather seating, and a separate oven and grill. The 580 is under seven metres long, but be aware that the habitation door is on the UK offside. The panoramic sunroof above the driver’s cab can be left open while on site. It helps flood the lounge area with natural light. The ML-T 580’s front lounge boasts comfortable seating and quality cabinetwork. There’s no step up into the cab, which will please many buyers of this motorhome. As we said earlier, the motorhome we reviewed was fitted with an optional and very UK-friendly separate oven and grill, as well as a dual-fuel hob and a tall fridge with built-in freezer compartment. This 142-litre Smart-Tower fridge saves space and will take plenty of supplies. Its bottom shelf features a handy bottle storage area. The kitchen drawers have dividers, allowing you to organise your space and retrieve items with ease, and there's a good sized overhead locker. The drawers in the kitchen have handles and positive catches. The ML-T 580 carries the fixed twin-single beds layout. These can be linked by an optional cushion that fits between the cold foam mattresses. The ML-T 580 is a two-berth, but you can add an extra sleeping position in the lounge, by specifying these optional cushions. In one of the most elegant design solutions ever, you just post your loo roll through the locker door. It keeps things neat and tidy. Hymer has opted for a bench toilet, rather than a swivelling one. It does save space, though, which is necessary in this washroom. The shower cubicle is a moulded plastic unit with built-in storage for soaps and shampoos, and bi-fold doors to contain spray. The rear garage can be accessed from both sides of the vehicle and has a 250kg load limit. It’s tall enough to hold a couple of bikes. There are various places to store clothes in the ML-T 580, including a top-loading wardrobe in the foot of the offside bed. There’s also space for clothing in a cupboard at the foot of the offside bed. It also benefits from height-adjustable shelves. Come the end of the Practical Motorhome Hymer ML-T 580 review, it is clear that this is a well-built ’van with rear-wheel drive and immaculate underpinnings. 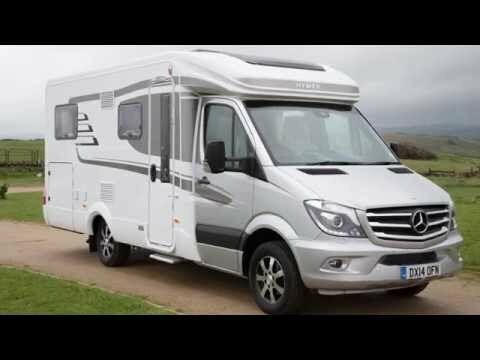 The layout is available in other Hymer low-profiles, but for some buyers only the Mercedes-Benz badge at the front will do.